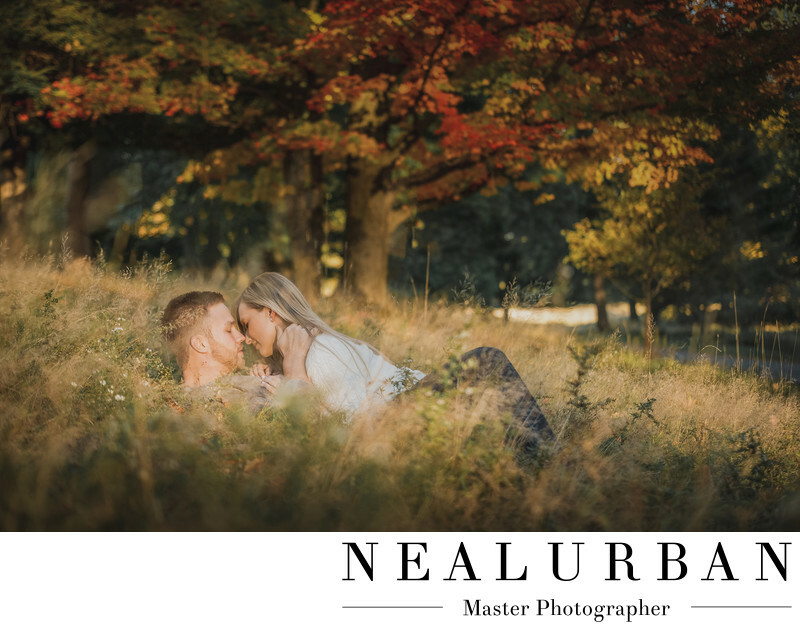 We had a beautiful fall day for Gus and Balon's engagement session at Knox Farm State Park. She really wanted fall foliage and they both loved the outdoors. She mentioned she loved giant trees. And they would love to bring their dog for a few photos. Knox Farm State Park in East Aurora was definitely the location for their engagement session. The colors of the leaves in this image are amazing! We got every fall color scheme in that one tree. It looks like the tree was a painting, but it was really there. We pretty much just walked around the park for photos. We had no particular locations in mind. It is a big park. We wanted to find some different areas for Gus and Balon's photos. This spot just happened to be off of one of the small stone roads on the park. There was a gently rolling hill with some tall grass. And the gorgeous foliage in the back ground. We had to take advantage. Gus is super tall, so we couldn't have them stand. They would have covered the trees. We decided to have them lay down. Super playful pose and it always makes for a fun image! We love how intimate this picture turned out. We got a lot of laughing at first, then Gus and Balon got serious. Neal took the image from a very low angle. He was laying on the ground and shooting through the grass. Such a great idea! This lovely couple got married at Holiday Valley Resort in Ellicottville, NY.